Cold Chisel has announced a very special one-off show in Adelaide on Friday, 2 March 2018 to mark the 20th Anniversary of the Adelaide 500. It will be the first time the band has played their former hometown since their huge One Night Stand tour in 2015. 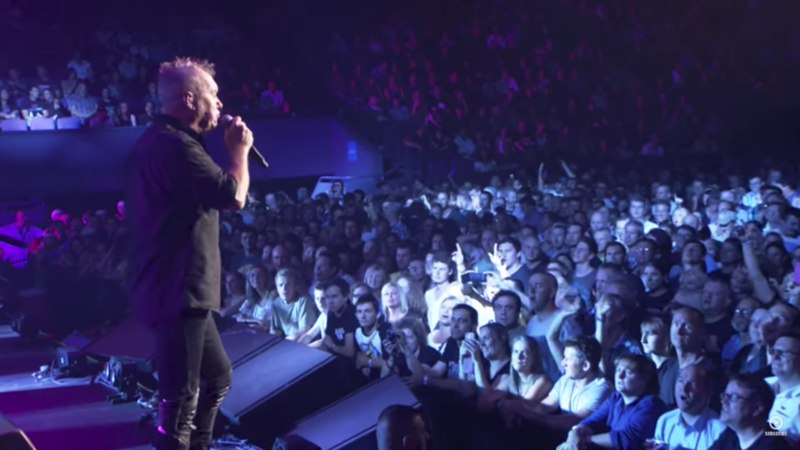 When approached for this milestone event, Cold Chisel were determined to make it a unique show – and went about personally hand-picking a bill of South Australian-born artists. Under the banner of ‘Made In SA‘, they have invited their friend Kasey Chambers, the critically-hailed rock outfit Bad//Dreems and two local Music SA openers to join them. 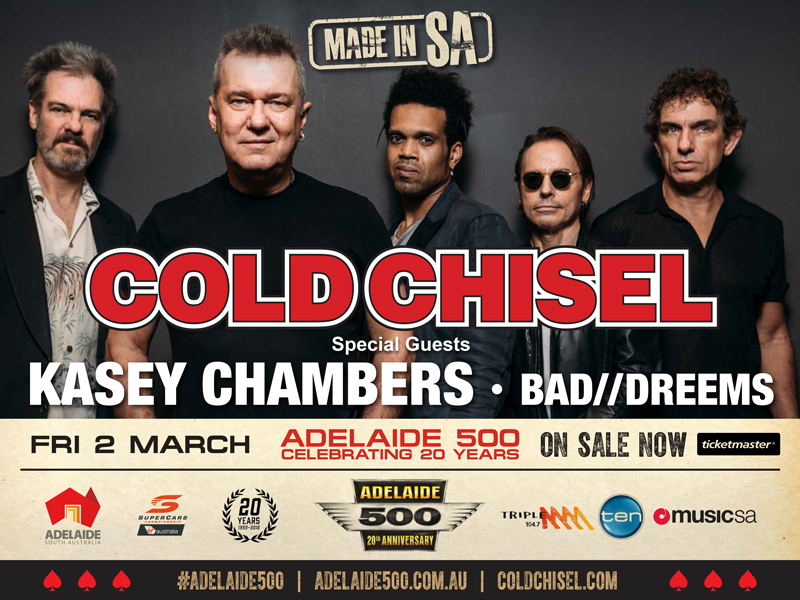 Originally formed in Adelaide in 1973, Cold Chisel is one of Australia’s most revered rock outfits with a history that spans forty years and a catalogue of songs and albums that have become part of the nation’s psyche. 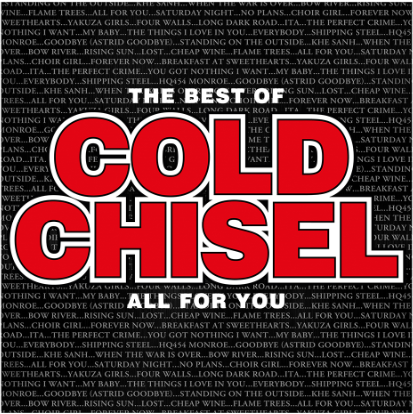 Renowned as one of the most dynamic Australian live acts ever, Cold Chisel will perform iconic hits such as Flame Trees, Khe Sanh, Cheap Wine, Choirgirl, My Baby, Rising Sun and Bow River as well as music from their recent studio albums, No Plans (2012) and The Perfect Crime (2015) – all of these and more are featured on the band’s new live album/DVD The ‘Last Stand’ of the Sydney Entertainment Centre‘, Cold Chisel’s biggest live release ever (out on November 10). “I couldn’t be prouder to perform at this rocking Adelaide 500 event and be part of such a great line-up of musical legends, fellow South Australians and good friends” says Kasey Chambers who was born in Mt Gambier. This show will mark the first time Kasey and her band have appeared at the Adelaide 500. Bad//Dreems are a rock band from Adelaide, South Australia. Consisting of Ben Marwe (Vocals/Guitar), Alex Cameron (Guitar), James Bartold (Bass), and Miles Wilson (Drums), they have released two great albums (Dogs at Bay in 2015 and Gutful in 2017) both of which were produced by Mark Opitz (Cold Chisel, INXS). Bad//Dreems performed at the Adelaide 500 in 2014 as a Music SA opener and are now headlining with Cold Chisel and Kasey Chambers.